Today we are testing out some fab products sent to us by Rimmel London! Aideen and I were both super excited for this particular #ealtuesdaytryout, as we both LOVE Rimmel makeup and couldn’t wait to try out some of their newer products. Since it's no secret I love my eye makeup, I was super excited for the opportunity to try out some of the Scandaleyes products. I must admit that I am not a huge fan of liquid or creme shadows… but to my surprise I actually really fell in love with this shadow! It has a great texture that sets nicely, without looking cakey or clumpy. It also has a great metallic pigment as you can see in the swatch below. The shadow comes with a spongy "spatula applicator." It is actually quite convenient and works very well for for applying the product to your eyelids. I will note that I did blend the shadow out a bit with a brush from my own collection to achieve the look I shared below. This shadow paint is available in loads of different shades so be sure to check your local drug stores for the full line. This is a great basic black eyeliner. The felt tip makes applying the liquid liner a breeze, especially if you are like me with a busy schedule and don't have a lot of time to fuss in the mornings. I am able to get a smooth and precise line without a whole lot of touch up. The liner definitely lasts throughout out the day without melting or really needing any sort of touchup or reapplication. However, it comes off easily at night with a gentle makeup remover. These all retail at a great price point. I am definitely trying to keep myself to a budget this year, so I have certainly been on the lookout for more affordable make-up products that are still good quality and will hold up to a full day of wear. As I mentioned already, Rimmel has always been a favorite of mine. Their makeup is affordable, yet I don't feel like I am compromising on the quality. When Emily contacted me and said Rimmel were sending us some goodies to try I was SUPER excited. I work part time in a pharmacy and we stock Rimmel so I am always buying and trying any new products that come in. So when the package arrived to #ealhq, Emily was so good as to send me the 2 Kate Moss for Rimmel lipsticks!! First I have to say.... I don't usually wear lipstick.... I know shocking.... I haven't owned one since I was younger!! Usually I go for a coloured gloss HOWEVER recently my go to product for when I am doing my make up (I don't get to wear it very often) is Rimmels apocolips lip lacquer. I LOVE apocolips-if you haven't tried it I really recommend it-my favourite shades are Stellar and Apocoliptic. I was so excited to try the lipsticks as it has been years as I said and the two shades I got to test are 102 & 109 from Kate's lasting finish collection.109 is a coral peach shade which I really like-coral is an amazing colour on any skin tone. And 102 is a pink shade which is very pretty for day time girly looks. 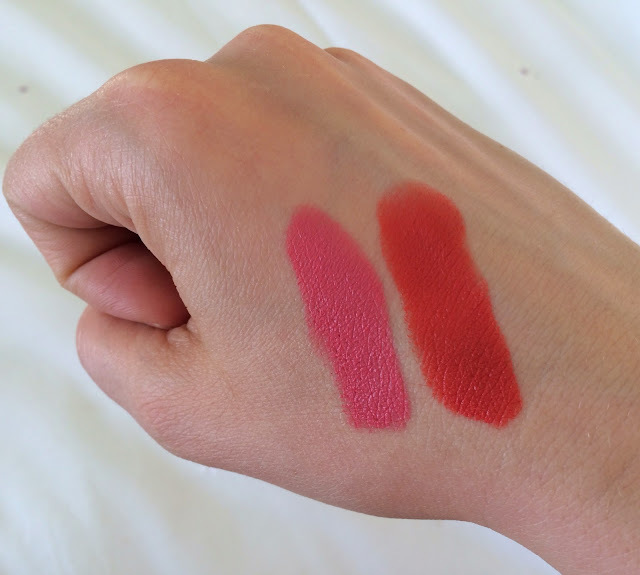 I really enjoyed playing with these lipsticks-they glide on smoothly and easily and give a great true colour on the lips. There is a scent to the lipsticks but it is mild and after a bit you would not notice it. They have a soft sheen finish that did not bleed out and lasted well for 4 to 5 hours. It was not drying on my lips as I had a base of lip cream on first. 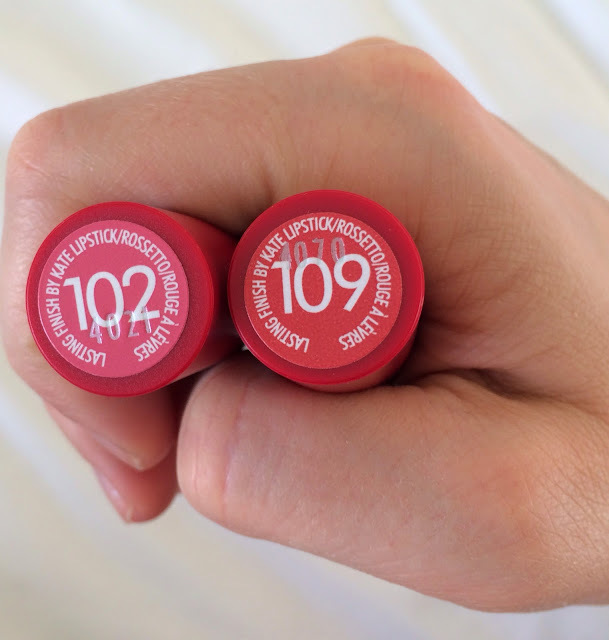 The colour is great from both of these shades but for me, my personal favourite was the coral shade 109. Thanks Rimmel London for sending us all of these makeup lovely goodies to try out! We had so much fun playing with everything, and definitely have some new faves!